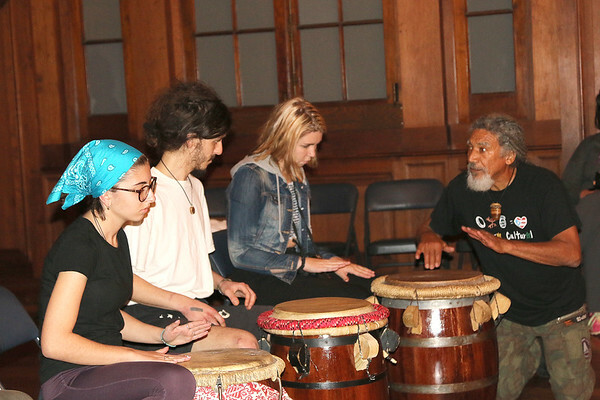 Angel “Balancé” Reyes from Taller Balancé teaches New College students to play Bomba rhythms on his homemade drums. Master Bomba performer Angel “Balancé” Reyes brought traditional Puerto Rican drumming and dancing to College Hall on Friday, Feb. 1 as New College began its commemoration of Black History Month. Bomba is Puerto Rico’s traditional music and dance, and it was born from the mix of enslaved African people brought to the island by Spanish conquistadors; Taínos, the island’s native people; and the Spaniards. “This is a genre of drum and dance,” said Reyes, who runs the Bomba group Taller Balancé out of Palm Bay, Florida. A bombazo, or Bomba feast, Reyes explained, consists of “one set of cuá, one maraca, one buleador, and one subidor.” The buleador and subidor are types of barrel drums, and cuá are the sticks previously used to play the drums. In addition to his work as a Bomba performer, Reyes is also a skilled craftsman who used the same techniques his ancestors did in the 16th century to make the drums he played during the workshop out of rum barrels and animal skins. Assistant Professor of Caribbean and Latin American Studies and Music Hugo Viera-Vargas, who joined New College from the University of Puerto Rico at Río Piedras, accompanied Reyes on the buleador, which keeps the rhythm, while Reyes improvised on the subidor. Johanna Alduen, Reyes’s partner, played the maraca while she sang. New College students, faculty and staff played along on the cuá and took turns playing the drums. Enslaved Africans, who hailed from different regions of Africa and did not speak the same language, used Bomba as a way to communicate in the sugar plantations. Alduen and Reyes demonstrated how Bomba dancers use movement to communicate with the musicians as the subidor mimicked the dancers’ movements. To close out the evening, Taller Balancé played while participants formed a Batey, or dance circle, and took turns improvising Bomba rhythms. The New College of Florida Black History Month Committee presented the Taller de Bomba Balancé workshop in collaboration with the New College of Florida Black Student Union (BSU), the Caribbean and Latin American Studies Program at New College of Florida, and the Association for the Study of African American Life and History (ASALH) Manasota Branch. Click here to see the New College’s full Black History Month event schedule.